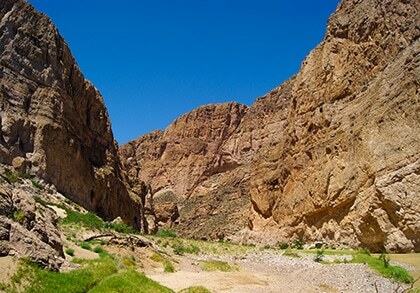 Ensuring the safety of a protected area often involves periodically changing video surveillance positioning. The S5s solar powered autonomous mobile robot effectively meets this challenge. Along with a panoramic video surveillance system, this mobile robot comes equipped with solar panels that recharge its built-in batteries. The electric power generated by the solar panels is sufficient to power a video surveillance system round-the-clock and to transmit videos via WiFi. In areas with many sunny days, the solar panels can sufficiently replenish energy spent by the robot’s moving around. To ensure long autonomous operation without recharging from an external source, the S5s is equipped with an intelligent system that forecasts energy expenditure and the rate at which electric power is replenished. Depending on the intensity of solar radiation during the day, the system calculates the distance that the robot is able to cover without its batteries becoming depleted. The S5s’ solar panels are installed on a rotating mechanism allowing them to track the sun as it moves across the sky and thereby obtain the maximum power possible from the sun. 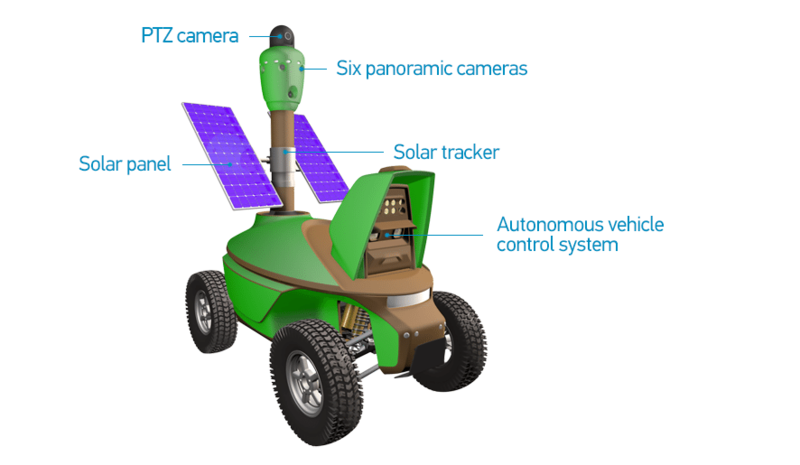 The Solar Powered Security Surveillance Robot is produced in two variants. The solar panels in one variant are twice the size of those in the other variant, resulting in twice the electric power generated. 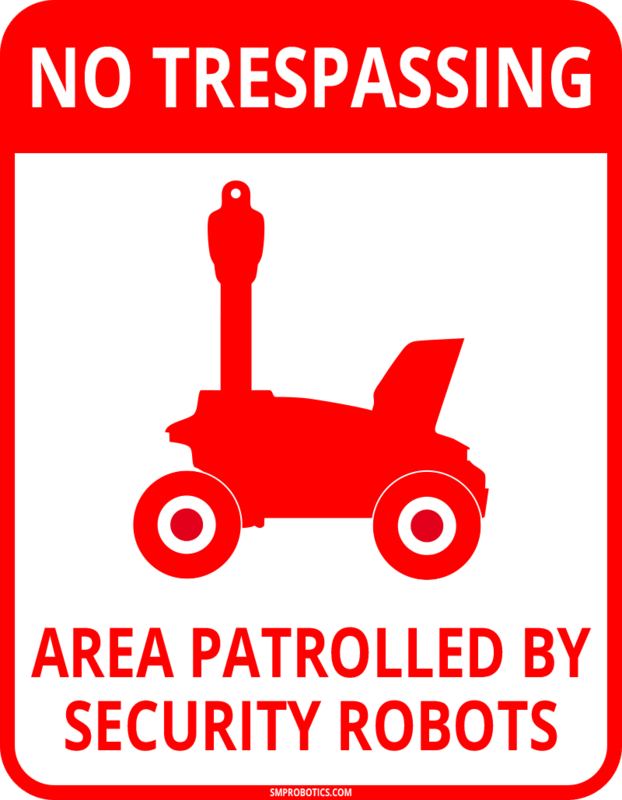 The robot variant with a smaller square footage of panels is designed for video surveillance where positioning rarely changes or for work at low latitudes. Some areas need to be placed under video surveillance for a short time only, and therefore equipping them with stationary CCTV systems is not viable. Such challenges often arise in agricultural settings. For example, the fields might only need to be placed under video surveillance when the crops are reaching maturity. Surveillance of pastures is advantageous only while cattle are roaming around them. In addition, pastures, fields, and hills that are optimal for surveillance do not, in most cases, have a power supply. 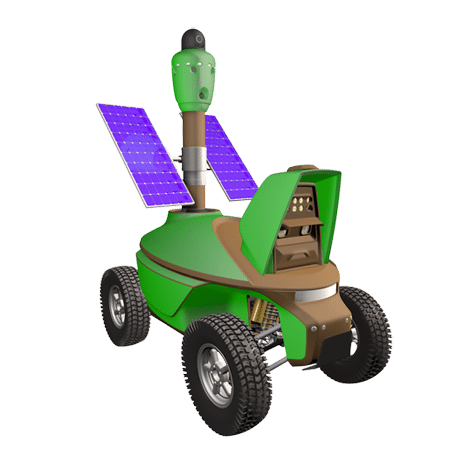 For the agricultural sector, mobile video surveillance using the Solar Powered Security Surveillance Robot is much more efficient than setting up stationary surveillance systems. Mobile robots do not require establishing expensive infrastructure, putting up poles, or laying down cable. Conveniently, robot delivery is followed by setting up position specifications to include operational shift times. Additionally, the robots equipped with solar panels will properly perform their functions without any human intervention, while periodic automated robot relocation will create additional difficulties for potential intruders. Videos captured from a remotely located area on a ranch or farm can be useful for incident investigations. The security robots designed for agricultural applications have a video archiving mode, allowing the user to access records when needed without having to constantly monitor camera images. The built-in DVR specifications provide for storing video archive from all the cameras for up to a month. The solar tracking system installed in the mobile robots ensures full autonomy, allowing for prolonged use on a farm or ranch. The solar powered robot cannot constantly patrol a farm or ranch, but it is capable of stationary video surveillance without interruptions occurring from charging batteries, unlike robots that can only be charged from stationary chargers. The Solar Powered Security Surveillance Robot does not waste time moving to an external charger and spending several more hours on charging; it carries out video surveillance without interruption. The autonomous security robot is equipped with a panoramic video surveillance system consisting of six cameras for all-round observation and a PTZ camera to track motion at a large distance. The images from all cameras are transmitted over WiFi to a Central Monitoring Station or a security officer’s laptop. The video surveillance system has a built-in DVR with a motion-detection feature. In automatic mode, the video surveillance system uses a 360-degree camera to look for sources of movement. In manual mode, the robot’s operators can control the camera at their own discretion. 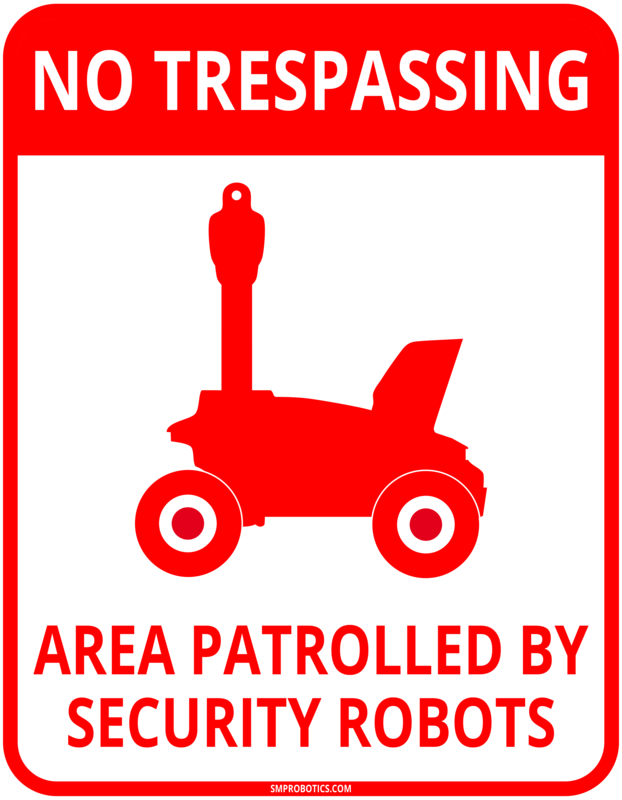 The security patrol robot performs remote video surveillance using WiFi wireless data transfer technology. When using the built-in omnidirectional antennae, the data transfer distance between the robots and the base station may reach up to more than half a mile. To transmit video at a distance of several miles, it is necessary to use a directional antenna on the receiving side in the Central Monitor Station. In the presence of obstacles between the robot and the monitor station, such as buildings or heavy vehicles, using an additional robot to relay the signal is feasible. Conditions for using the security surveillance robot entail equipping it with high-capacity batteries. Such batteries are considerably heavy, which makes it inefficient to use this type of robot for video surveillance where optimum observation positions change frequently. Our security patrol robot with its lightweight, high-capacity batteries was created to meet the challenges associated with patrolling restricted areas, as it moves along its patrol route while consuming less energy. Another security guard robot is equipped with a long-range acoustic device to physically prevent intrusion into a secured premise. This type of non-lethal weapon is capable of creating unbearable conditions for those who are trying to commit unlawful acts.